iOS 4's multitasking ability has opened up a slew of new possibilities for many iPhone apps. This is especially true for location-aware social networking apps like Foursquare or Twinkle, which can now continue to broadcast your location while running in the background. Loopt, a free location-aware social networking app for iPhone, is one such app that has been quick to take advantage of multitasking in its latest update. 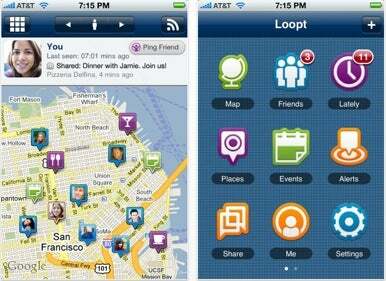 Loopt uses your iPhone's GPS chip to place you on a map and share your location with people on your friends list. It features the Yelp-like functionality of letting you see restaurants and businesses nearby, as well as locations where your friends have checked in. You can also sync it to Facebook and Twitter so it can share updates about your location. Released last week, the version 3 update requires iOS 4 and features background location sharing, which takes advantage of the new operating system’s multitasking abilities. Loopt 3.0 also lets you share your location with friends and family at all times—even while using other apps. It should be noted, however, that keeping background location sharing on will dramatically reduce your battery life, as will any feature that relies on constantly using the iPhone’s GPS function. Another new feature in Loopt 3.0 is the ability to set up friend alerts: push notifications that alert you when a friend is nearby. Loopt has also received a brand new grid view on the home screen, and the ability to choose favorite friends whose profiles can be quickly accessed from your home screen. Update 6/30 8:42 PT: Loopt apparently only uses cell-based location information while in the background to prevent it from sucking up too much battery life (though Loopt still warns it will drain your battery faster than not using it). Only turn-by-turn navigation apps can use GPS in the background.